Not all trademarks are equal in strength. 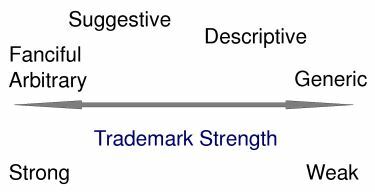 The strength of a mark is a measure of the extent and scope of protection provided for the mark under trademark law. As shown in the diagram, strong marks have a bigger buffer or protection moat around them and thus prohibit competitors from operating within that buffer. Weaker marks have a smaller buffer. The smaller buffer allows competitors to use marks that are more similar to a weak mark than would be allowed for a strong mark, all other things being equal. This post explains how to select a strong trademark so you can keep your competitors at a larger distance from you in terms of the similarity in the marks that competitors use. 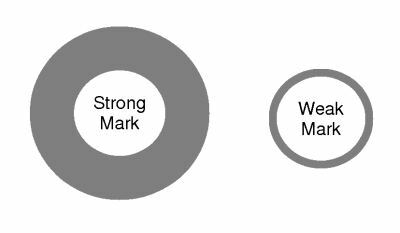 A strong mark is one that has a greater level of distinctiveness in relation to the product or service with which it is used.A strong mark should be distinctive rather than descriptive. Descriptive marks that merely describe the goods or services that the mark is used on or in connection with are difficult to protect during initial use. The reasons for this are: (1) to prevent the owner of a mark from inhibiting competition in the sale of particular goods; and (2) to maintain freedom of the public to use the language involved, thus avoiding the possibility of harassing infringement suits by the registrant against others who use the mark when advertising or describing their own products. The strength of a mark can be categorized along a continuum, ranging from marks that are highly distinctive (e.g.“Pepsi” for cola) to marks that are a generic name (e.g. “coffee”) for the goods or services. The degree of distinctiveness of a mark can be determined by considering it in relation to the specific goods or services. The degree of distinctiveness of a mark corresponds to the degree of protection provided by trademark law. The more distinctive a mark is the more protection provided by law. Marks that are highly distinctive when used in relation to the goods or services are considered arbitrary or fanciful. Arbitrary and fanciful marks are located on the strong end of the continuum. Next on the continuum are suggestive marks, followed by merely descriptive matter. Last are generic terms. Generic terms are at an end opposite arbitrary and fanciful marks. Fanciful marks include terms that are created for the sole purpose of functioning as a trademark or service mark. Such marks comprise words that are generally unknown in the language, such as PEPSI . 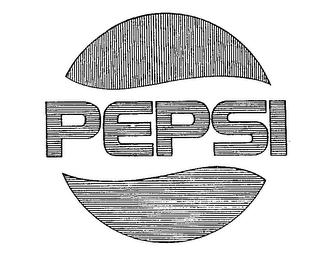 The word Pepsi did not exist before Pepsi created it and began advertising under it. Next, arbitrary marks are those that are commonly used but, when used to identify particular goods or services, do not suggest or describe a significant ingredient, quality or characteristic of the goods or services, such as APPLE for computers. The term apple had nothing to do with computers before Apple Inc. began using the term for that purpose. Suggestive marks are those that, when applied to the goods or services at issue, require imagination, thought or perception to reach a conclusion as to the nature of those goods or services. For example, BEAUTYREST suggests something about the nature of mattresses. A suggestive term requires imagination, thought, or perception to reach a conclusion regarding the nature of the goods or services. A suggestive term is different from a descriptive term because a descriptive term immediately tells something about the goods or services. A mark is merely descriptive if it describes an ingredient, quality, characteristic, function, feature, purpose or use of the corresponding goods or services. Descriptive marks may not be registered on the primary register without proof that the mark is widely recognized by consumers–that is the marks have gained “secondary meaning” in the marketplace. For example, BED & BREAKFAST REGISTRY was found merely descriptive of lodging reservations services. However, American Airlines was likely initially merely descriptive (its an airline that flies in America), but over time has become widely recognized and thus protectable. Generic terms are those terms that the relevant purchasing public understands primarily as the common or class name for the goods or services, e.g. coffee. Generic terms alone cannot be protected as trademarks. However generic terms are sometimes combined with other terms or components to achieve protection over the combination, e.g. Starbucks Coffee. However, the Starbucks Coffee trademark cannot be used to stop others from using the term coffee alone or in combination with other terms not similar to Starbucks. The strongest marks are fanciful and arbitrary marks. However, practically these marks require the most marketing resources to create consumer recognition. Suggestive marks provide a middle ground where the mark suggests a feature of the product or service thereby reducing the amount of marketing resources required to inform your customers as compared to fanciful marks, while still providing a reasonable amount of protection under trademark law. Next PostNext How long does it take to get a patent?